This nursing leadership intensive will provide Directors of Nursing and Nurse Managers in the post-acute care environment with education on how to prioritize, delegate, and promote critical thinking and effective decision making as a nurse leader. Nurse participants will have the opportunity to analyze reports and consider case studies to identify areas for improvement and develop strategic plans to assure quality and improvements for optimal resident outcomes. Nurse participants will be empowered with the tools and resources needed to be successful nursing leaders and will come away with an increased confidence and improved job performance and personal satisfaction. HCAM is an approved provider of continuing nursing education by the Wisconsin Nurses Association, an accredited approver by the American Nurses Credentialing Center’s Commission on Accreditation. 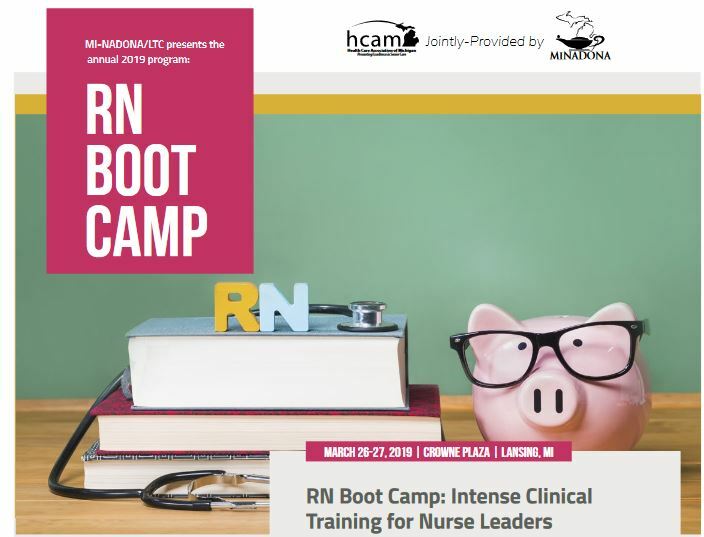 MI-NADONA/LTC is hosting their annual MI-NADONA/LTC RN Boot Camp March 26-27 at the same venue. Anyone who registers for both programs will qualify for a special reduced Workforce Happiness Seminar rate of $160. Why not send your nurses for three days of intensive training all at once? !